This RTV is used to run tubing on steep grades and in deep snow. Toad Hill Maple Farm reports that they’ve been busy thinning/logging a new section of sugarbush and running more tubing. When the weather eased up and the snow settled a little, they got busy stringing up a new mainline and adding another 300-400 taps, and eventually were able to start tapping, a job that takes 3-4 days, depending on conditions. Back at the sugar house, the Galushas are working on some new products and packaging for this year, so stay tuned to find out what they’ll have ready for Thurman Maple Days. 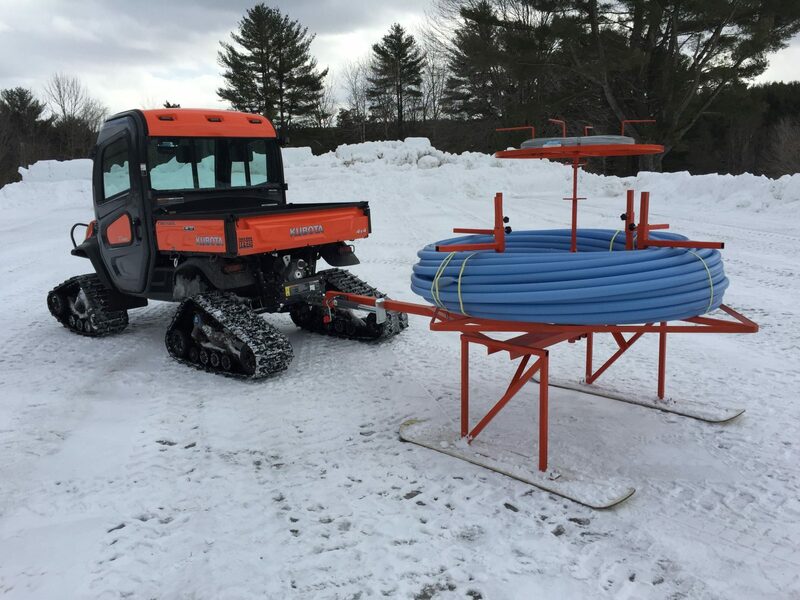 This picture shows Toad Hill’s Kubota RTV with tracks used to tow the mainline pipe reel and mainline support wire up into the sugarbush. Tracks are needed to get through deep snow and get up the mountain. First we drag the mainline wire off the reel and get it supported between the trees. Then we pull the mainline pipe off the reel and wire tie it to the support wire. After that we start running tubing from the mainline pipe to each of the maple trees. As chairman of Thurman Maple Days, Randy has also been spending time planning publicity and distribution of our 2019 Maple Days rack cards, going out to the public soon. All of us hope you have marked your calendars for March 16-17, 23-24, and 30-31. The rack card is your passport to all the sites. Pick up your card and have it punched at as many of the 10 farms as you can, and deposit with your complete information in the appropriate tub at any of the farms. The winning ticket will be drawn at the end of the last weekend of Maple Days and the winner notified as soon as possible.